I always love experiments/magic tricks. We were lucky enough to have Chantelle Rose back from her PolarTREC to the Arctic Circle. Right before Christmas the Graham High School science teacher returned to the area from her 50 day trip. She joined us on the morning show yesterday and she came bringing gifts... after all, she pretty close to the North Pole...kinda. While she was taking scientific readings and monitoring life below the ice she did an experiment. All of her students decorated styrofoam cups. Chantelle also decorated one for FOX 45. She put all of the cups in her laundry bag and dropped them to the bottom of the sea. The water pressure compresses the air pockets out of the cup and shrinks all the designs on the cup and makes the cup barely bigger than a golf ball. Very cool. Thanks for the gift and for keeping us updated on the Arctic expedition, Ms. Rose. On to my last blog forecast for 2011. Already picking up a few light showers across the Northern Miami Valley. The rest of us will see a few passing showers through the day today, but shouldn't be a washout. At least we will be warm today with high near 50...same for tomorrow, just no rain. Another chance for rain on Sunday, New Years, and then MUCH colder for Monday and Tuesday with highs in the mid 20's. We could see a little snow on Monday when the temperatures drop. Right now it is not looking like much more than just a dusting, if that. I hope you have a safe and happy New Year and see you back on here in 2012! Have a good one! The next couple of days I may regret starting my winter projects. Highs will be near 50 for the last few days of 2011. Remember New Years Eve last year? We hit a high of 61 in Dayton. We shouldn't be quite that warm, but enjoy what warmth we DO get. There is a slight chance for rain for Friday, mainly north of I-70 and another chance for rain Sunday and maybe a few flurries Monday...then say goodbye to the mild temperatures. The first week of 2012 looks to be the coldest stretch of days all season with at least three days below freezing the entire time. It has been a mild winter so far with barely any snow for the kids to enjoy. Highs next week will be in the twenties so at least it will cool off the ground enough for snow to stick for future snow storms. Well back to the news. Enjoy your Thursday...only one more day til the weekend. Have a good one! No snow, where'd it go? Two main factors played into the fact that we have next to no snow on the ground today: snow coming down light melting on the warm pavement, but the main cause was the dry air sinking in and soaking up the moisture. The switch from rain to snow happened just as planned, but that darn dry slot always will kill snowfall totals. Normally the dry slot is not as strong as what we saw yesterday, but was very powerful and was quite the sponge...soaking up the moisture. The Dayton International Airport did have 0.6 inches of snowfall yesterday, but nothing to measure sticking on the ground because it melted on the warm pavement. If the snow falls fast enough you can easily get it to stick to warm pavement though. Check the blog entry from Thursday, March 25, 2010...which has photos. It was a very similar situation where the pavement was warm...but we didn't have the dry slot. The two factors combined really killed us because since the snow was so light, it wasn't enough to stick. Blew that one...which you will not hear very often, but gotta own up to it. The good news is that we will stay dry for the next couple days. Today we will only get to about 32 for the high, but mid 40's for the rest of the week and weekend. There is a slight chance for a few rain showers to the north for Friday and a better chance for little rain for all of us in the Miami Valley on Sunday as a cold front punches in for the first week of 2012. Stay warm and have a good one! Dry air has punched in on the back side of the low pressure and now we have a cut off of most of the moisture. We may still see some moisture wrap around the low counterclockwise to get to us and with a little lift from the cold front pushing through Wisconsin we may see a little more, but we are pretty much wrapping up. The cold air is timing out about right, but the sinking dry air working in with the Low has completely killed the snow totals. At this point I would say a dusting for the Southern Miami Valley and up to 1" for the north. I have had light snow at my house in Dayton for about three hours now, but the ground is too wet for it to stick. Roadways will still be slick overnight as temperatures fall into the mid 20's. There also may be a little lake effect snow for the far Northwestern Miami Valley by Celina with strong northwest winds pulling more moisture off Lake Michigan. Sorry, doesn't look great for snowmen making today. Have a good one! Back from Vacation...Snow forecast for tomorrow. Back in the weather center and it still isn't 5AM as I am typing this... I had a lot of fun visiting the family and enjoying the holiday season. I received some great gifts and I can't remember anyone that was not super excited when they opened up the gifts from Dawn and myself. I really love sharing gifts more than receiving them because it is sometimes the thought and remembering the small things they mentioned to surprise them. I did get a new sweater vest I am wearing today... I may have a new one or two after a few returns at the store today. I also saw Sherlock Holmes II over the break and I highly recommend the movie. Well, the models are having a really hard time adjusting to the change of seasons. My last blog entry, last Friday, the models were showing us remaining dry all this week. That changed a lot. There will be a push of Gulf moisture and that will smash into an arctic front tomorrow. This is a very tricky system because the switch over from rain to wintry mix to snow will determine how much snow we are expected to accumulate. The models over the last 12 hours have still be having a hard time deciding on how much snow will fall as well. Some have shown as much as 6+", but I highly doubt that will happen. We have been so warm and we actually warmed up to 50 degrees yesterday for Christmas. The first snow that falls will melt and it will take a decent amount to accumulate. Here are my thoughts by Tuesday night and Wednesday morning. I think the far Northern Miami Valley may have 1-3+". The central part of the Miami Valley will see between 1-2" and the far south will see up to 1". This may change if we switch to snow early with cooler temperatures arriving sooner. I will have an update tomorrow morning with fresh look at the accumulations. Mild for the rest of the afternoons this week with another slight chance for rain on Friday. Right now it looks dry for any New Year celebrations on Saturday night. See you back on here soon...have a good one! Spending time in the kitchen and cleaning the last couple days has been a lot of fun but also a lot of work. When you visit others you forget all the work that needs to be done beforehand. Not that the house was dirty at all... it was actually REALLY clean, but you still need to dust again, vacuum, cook, clean some more, tie up some loose ends, clean some more, and then finally crash on the couch only to get back up and check on the roast. It is totally worth it once all is said and done, but it is a lot of work in the meantime. I got to share the duties yesterday with Dawn and her mom and we were quite the team running around the house with our mental checklists. The temperatures fell last night and we were JUUUUUST cold enough to get a brief dusting, but it will melt by the afternoon because we will get above freezing. I wish I could bring you better news for a White Christmas, but at least you will not need the boat to get to grandma's house. I will be busy around the area spending time with my family over the next couple days so Happy Holidays, Merry Christmas, Happy Hanukkah, and I will see you on Monday! (If anyone receives a sweater vest as a gift, send me the pictures, and I will have a blog dedicated to the spread of vest-cheer) Have a good one! No, that picture is not me. You may have noticed me taking the back-burner the last couple days. I am taking a week off and spending a lot of time with friends and family. The picture is from Ms. Rose, the Graham High School teacher, who has been in the Arctic Circle the last month and a half doing research on the ocean life below the ice. The image is of her pointing to a lenticular cloud. They are, hands down, my favorite cloud and are very rare here in Ohio. You need very specific conditions for the clouds to form and if the conditions last long enough it will look like pancakes stacked on a plate. I have only seen them twice in Ohio... Once with an over riding, on-coming front and another time when a thunderstorm was growing so rapidly it lifted a sheet of air to form the flying-saucer-looking cloud. She is expected to return to Ohio just before Christmas and I can't wait to interview her on the morning show the week after Christmas...when I am back at work. Speaking of my vacation. One of the things I enjoy the most is not shaving. I have a decent scruff going right now and maybe before I shave it I will grab a picture. I visited my childhood church where my mother had a big roll in the Sunday services. I spent some time on the family farm and got to hang out with my two wonderful youngest siblings and then Monday we visited my grandparents in Cincinnati and they were overjoyed with the gift we got for them. (Not expensive, but lots of time and love) I would tell you what it is, but we still have two more of the same gifts to give out to Dawn's family. I will show you after the holidays. While most people take time off in the middle of the summer and spend it on the beach (kinda wish I was there)... I am taking it off with a week of rain and clouds. I wish it was sunny and warm, but ehhh, I love Ohio and the people that live here too much to go anywhere else with my saved-up vacation time. The models yesterday were very hopeful for at least some snow on the ground for Christmas morning. The models have trended away from snowfall with the disturbance coming through Christmas Eve, but don't give up hope completely. In winters past the models that come out about five days out hold true better than the models two days out, so we will have to wait and see and I will keep you posted, no worries. As for the next few days: rainy, mild, and foggy. I can barely see down my street right now because the rain has stopped and now it is like pea soup fog. The rain will be the heaviest Tuesday night and Wednesday night, but breaks in between. Wednesday and Thursday will be the warmest of the week and then much cooler for the end of the week heading into Christmas with highs back in the 30's. I will be back on before Christmas with an update, but get used to rainy, gloomy conditions. Trust me, I wish I could change that. 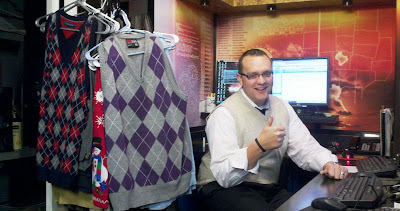 I will keep the sweater vests ready for re-deployment next week when I return to work. Until next time, have a good one! We all know one thing...Facebook is always changing. The big change has been in the pipes for a long time and it is now "LIVE" for those who want to get a jump on it. The picture shows that the new look will take a little longer to load because it is a little more picture based. There is now a top "cover photo" and the timeline on the right side (below the ads) that can show you everything you posted or others posted to your wall since you signed up for Facebook. If you want to switch over your profile before the assigned date, you can. I read online that December 22nd everyone's profile would switch, so might as well get ahead of the curve. 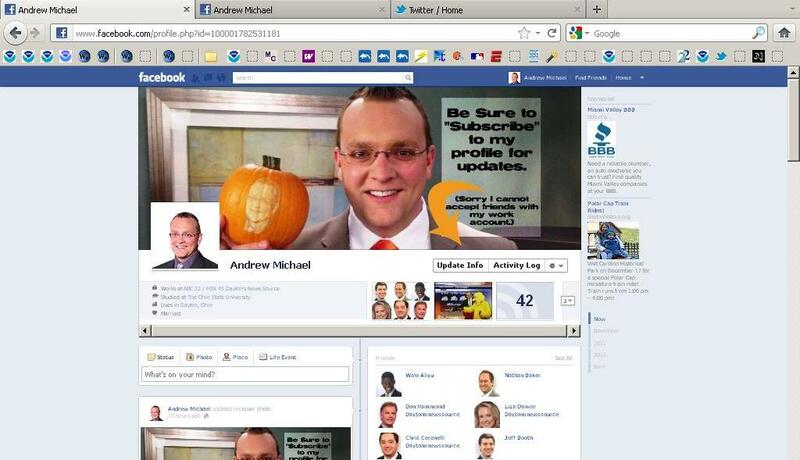 If you want to switch your profile now you can just go to www.facebook.com/about/timeline and then click on "Get It Now." Make sure to take time to review all of your old posts. You can tweak your timeline and delete any unflattering photos or posts for a week before it is published for others, unless you are to eager to share your life story...or you can make the new timeline public for your friends to see when you are ready. You can also hide certain parts of your wall or even highlight parts of it to show off to others. Much colder out there today compared to the last couple of days. We are sitting in the low 30's at 5AM...so about 25 degrees colder than this time yesterday. We will see the clouds clear out through the day today and sunshine will be around for the weekend with highs in the upper 30's for today and tomorrow. We will tap back into the 40's for Sunday and next week, but lows will be in the mid 20's til then. Rain also returns for late Monday, Tuesday, and Wednesday next week. The next system right before Christmas looks like it will not be quite as cold, but there is still a very slight chance we could still see snow. I will keep a close eye on that. Today is my last day on-air for a week, but I will make sure to update my blog next week while I am spending time with family and friends for the holidays, so make sure to check back in for a look at the forecast and how the holidays are going. I hope you have a Happy Holiday and a very Merry Christmas...and as always, have a good one! Lookie, Lookie, Try My Cookie! It looks like another morning cooking competition... although I am not sure if we are competing or not... (In my head, maybe!?) I made the SUPER easy, SUPER cheap Buck Blusters (a combination of blustery and clusters...since they are clusters and great for blustery weather....ok, I made that up). One can of Spanish peanuts. Heat the chips, stir in the nuts, drop on wax paper... It only costs about $5 to make about three dozen Blusters... Buck style. Let them cool about 30 minutes and you are good to go, or as Dawn and I call it, G-ta-G.
On to the forecast. Morning rain today and a few breaks in the rain. This afternoon we will begin to dry out and then we will deal with cooling temperatures through the evening...but not before we get into the mid and upper 50's for the middle part of the day today. Try to enjoy the warmth because it will be a long time before we are that warm again. Weekend will be mostly sunny and temperatures in the upper 30's, near 40. More rain will return for the start of next week as we stay in the 40's and then another system later next week that MAY bring snow just before Christmas... the models have warmed up JUUUUST a bit. Anyway, I am training Chris Mulcahy for the morning show, so I got to get back to that. Stay dry and have a good one! What a better way to spend an evening than raising your truck five feet in the air and repairing it. We had to replace the water pump and, while it was convenient, an oil change. I am very jealous of my friend's lift, but no way would it fit in my garage. I spent most of yesterday with Dawn, who was home sick from work. Hopefully she feels a little better today. I will not be able to take care of her all day today because Jeff Booth and I will be going out to lunch with our new meteorologist, Chris Mulcahy. I have met Chris, but it will be nice to sit down and chat about stuff. It is a rare occasion that we all can get together because of the opposite shifts. Rain showers and mild conditions this morning. The rain showers will dry up a little bit as we head into the late morning and afternoon, but more showers and storms will roll in tonight. As of 5AM we only need. 0.59" more rain to get to the #2 wettest year on record...should likely happen by tomorrow morning. Warm again through tomorrow, mid 50 for highs, and we will dry out later tomorrow...then temperatures dropping, near 40 for highs, for the end of the week and weekend. At least the weekend is looking dry, but more rain returning early next week. There is still another system on the long, long term models right before Christmas with much colder air and moisture...snow still looking possible. The last three out of four model runs have shown a decent amount of moisture for a little whitening. More on that in the days to come. Stay dry today and have a good one! First time I have put up the tree in two years. I didn't put up the tree last year because I just couldn't get into the spirit of the holiday because of working so many long streaks of work (16, 19 day streaks) and no time to really celebrate with family and friends... Well I guess that is a lie. I did get to celebrate. It was two years ago I wasn't able too and thus leaving me in a weak Christmas mood for last year and I took off the week before Christmas as a safe guard. Anyway, I spent most of the day yesterday studying for my CBM test...at the gym, home, during my sleep...hope I pass. After all the studying, I did a little house cleaning , rearranging and put on the Christmas tunes. With Buckeye blind we can't move too much of the house so I was able to move a table and it worked out perfectly for the Christmas tree. I also put up the nativity set that my sister got for me a few years ago. I may even get a little crazy and decorate outside a little today...after studying. Temperatures will be favorable for being outside this afternoon. Clouds are rolling in this morning and we will be mostly cloudy today with a high in the upper 40's. Rain arrives tonight and will stick around the area over the next couple days with a few breaks. The rain will also bring in MUCH warmer temperatures and we will be in the upper 50's...not to shabby, but a little soggy. Cool air will return for the weekend, but at least it is looking dry with highs in the upper 30's, near 40. We have two systems next week and the second system, just before Christmas, looks to bring in colder air and we MAY see a little snow on the ground for Christmas... still WAY to early to call just yet, but there is hope. Enjoy the mild temps and dry weather today and have a good one! I will admit that my Christmas tree is not up, yet, but I am still in the spirit of the holiday season. 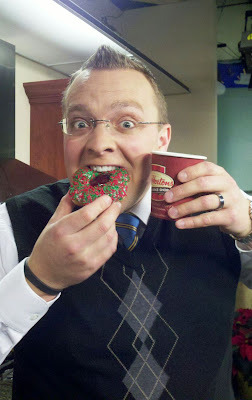 We had Tim Horton's in the station on Friday and they got my holiday weekend kicked off right. Dawn and I knocked out most of our holiday shopping Saturday, but we still have a couple of people to finish off the list. While it does feel great to get most of that finished, the real accomplishments came at home. I put up new curtain rods in the bedroom and black-out curtains to help me sleep during the day since I am awake nearly all night long with my shift. I also insulated the entire house's windows. While it only cost about $30, I think we will EASILY make that back over the next few months. It is amazing how it cuts down on the draft you never noticed before. The rooms used to have a little chill to them, but now they are more temperate and once you warm up all the rooms the thermostat in the middle of the house SHOULD be a little warmer and kick on the furnace a little less. Now I just need to power through this week and then I took next week off for the holidays. Everyone always requests the week after Christmas off, so by taking off the week before I can visit family and enjoy the season a little more. Well, the models are really keeping us mild until Christmas. I would say we have a 25% chance for a White Christmas at this point...more updates as we get closer. The sunshine over the weekend was REALLY nice to help raise the spirits. I am done with all the clouds and dreariness. Plenty of sunshine today to start the workweek and despite temperatures near 20 now, we should warm into the low 40's today. We will continue to warm the next few days and by Wednesday and Thursday we should be in the 50's...MUCH warmer than normal. The only trade-off will be a chance for rain later Wednesday and Thursday. That rain will be coming with a cold front and will drop our temperatures near 40 for the highs for next weekend. We will need to get colder than that if we want the ground to stay cold enough for snow to stick for Santa. Stay warm, enjoy the sunshine, and have a good one! I have talked to dozens of local schools and thousands of students...but recently I did something I have never done... talked to home schooled students. I was sent this photo from my recent talk with the South Dayton Christian Homeschoolers. The kids were a lively bunch and we met at a local library meeting room for the talk. The kids had a lot of fun and had A LOT of questions. I love it when the kids have a lot of questions that they come up with during the talk. The more, the better because if one person asks a question then it is likely another student was thinking the same thing. Yesterday was pretty much awesome. I did a satellite interview with Archie Griffin and I gave him the "O-H!" and I got an "I-O!!" back....I think I may have climaxed my career too early, what do you think? After I left work, I went to the gym and did squats for the first time...in years. I can barely walk today. I then ran to the auto parts store to get a new water pump for my truck and then home. I did a little moped wrenching and then took a much needed nap. I slept for at least five hours and Dawn woke me up at 7:30PM so we could head out to watch the Browns play the Thursday night game on NFL Network. Browns scored a field goal on the opening drive and then Steelers scored a touchdown following that. Then no scoring until the end of the fourth quarter when the Steelers blew through our secondary and scored a 79 yard touchdown pass. James Harrison had another helmet to helmet hit on the Browns...this time it was our QB Colt McCoy...who doesn't even remember the hit. This is the third time Harrison has knocked out a Browns players thanks to his helmet to helmet hits in the last two games. I understand wanting to be known as a hard tackling back, but c'mon, let's keep it clean. If I have anything to say about the game last night... I am proud that the Browns held tough with Steelers and only lost the game by 11 points...could have been much worse. We are dealing with a few light snow showers off to the north this morning. The far north has seen right around half an inch so far with maybe another half an inch or less...so a total of up to 1". We have not seen anything in Dayton, so all of it staying north of I-70. Dayton still has a few slick spots...I saw a couple, on my way into work, in locations where water was standing the last couple days from the rain earlier this week. Tonight we will drop into the upper teens and we should see the coldest temps of the season tonight. We will stay dry and warm into the lower 40's for next week. There is a weak system on Tuesday that may bring a little rain, but a more potent system later in the week with a better chance for rain. Stay warm this weekend and have a good one! We have done the pumpkin carving, pumpkin chucking, chili cook-off, and I am sure a few more competitions...and now we move on to a gingerbread house building competition. I went light on my icing on the house and focused more on simplicity and detail. I decided instead of outlining my windows, I put a light dusting on them for a frosted look and outlined my sidewalk to the house with red hot candies. We will be judged by two judges from a local gingerbread competition going on this weekend and Facebook on the station's Facebook page. There are three votes and three houses... probably ending in a three way tie?!? Doubtful. Snow looking more promising for the tomorrow...for PART of the area. The northern part of the area may see up to 1" and that is to the FAR north. Most of the snow will be staying north of I-70 and the area just north of the 70 divide will probably only see a light dusting...if that. There is not a lot of moisture with this system, but enough to make things interesting. Dayton may not see much of anything. It appears the snow will start in the early morning for the far north Friday and push off to the east by Friday evening. That will leave us MUCH colder for the weekend with lows in the teens for Saturday and Sunday. Highs today & tomorrow will be in the mid 30's. We will be hard pressed to get to 30 for the high on Saturday and then quickly warm up into the upper 30's by Sunday and low 40's for early next week. We also could see a little rain for the middle of next week, but who knows... still cold enough that if we dropped a couple degrees it could be snow. Make sure to vote for me and have a good one! Every year the Wilmington office of the National Weather Service they hold a media meeting to go over changes at the office and update everyone on what is new. Yesterday they also invited the local EMA directors and it was a very enlightening meeting. It is also really fun to get together with the local meteorologist and have some in-depth discussions on topics that we find dear to our professions. I am also excited about changes coming behind the scenes, but still have to wait nearly a year before the dual-pole radar is upgraded. Something to look forward to for next year. Things will be pretty quiet for today other than a little drizzle this morning...with temperatures near freezing there may be a few slick spots, so be careful. The chance for the rain/snow later this week put on its brakes and is now looking to swing through on Friday now. We will only get into the mid/upper 30's through the end of the week with lows in the mid 20's. The Friday system still will swing by to our north...not a lot of changes other than it's timing bumped back to Friday. That will bring in MUCH colder air for the weekend. When we drop below freezing Friday night we will likely stay below freezing until Sunday afternoon. Other than Friday we will be dry over the next week, which I am sure many people will not mind with the localized flooding still an issue. I had to take a detour myself into work that added five more minutes because of the flooding. Stay warm and have a good one! Flooding Today, Snow by Thursday?? With the 1.95" of rain Dayton saw on Monday it broke the daily record for rain for December 5th with the old record of 0.72" set in 1977. We smashed the record! Many of the rivers and streams are near or juuuuust above flood stage this morning and are already starting to drop. By Wednesday morning we should see most of the rivers below flood stage. Other than Thursday, we will be dry over the next week. The system on Thursday is still a little tricky. It looks to scoot just to our north and we MAY see a few flurries, but I am starting to doubt it. I have mentioned before that these early-season systems pull a little more north than what the models show. As you can see in the image we are on the far southern edge of the system already. I am right now calling for a 20% chance for rain/snow, but I may be giving it more of a chance than needed. I think tomorrow we will really see and may be dropping that percent chance even lower. The temperature also will be the deciding factor between rain and snow. Well other than the rain leaving today and the chance, slight chance, for rain/snow for the Northern part of the area Thursday...it will be pretty quiet, dry, and cold. Today we should see 40 for the high, then upper 30's through the end of the week. By the weekend we will see highs near freezing, so most of the day will be below freezing. We will see a few clouds heading into the start of next week...but no rain or snow. I am pretty sure everyone will be happy to dry out a little bit. I will keep you posted on Thursday, so stay warm and have a good one! It seems like Dawn and I never get a weekend to just chill and relax. (Maybe next weekend) This weekend was busy, like the rest. Friday we had her work Christmas party at UNOH in Lima. It was a lot of fun, especially the games they had planned for some of the workers. We then went to Cleveland for the weekend and finished off the weekend with the Browns game with the couple we met on our honeymoon. Despite the drizzle, chilly temps, strong winds, and the Browns loosing, it was a lot of fun. I just had to try to keep warm as best as possible. Well the rain is going to stick around today. As of 5AM, Dayton unofficially jumped to #3 for wettest year ever with 52.26", #2 is reachable with 54.65" in 1996, & #1 is 59.75" in 1990. We could see about 1-2" for the day today with temps falling through the 40's. Tonight the rain will pull out of here and we could see a few flurries mixing in on the backside of the system, but not looking at accumulations because temperatures look to be slightly too warm to have a prolonged snow event. Temperatures will be much colder tomorrow with a few flurries in the morning. Highs the next few days will be near 40. Another system will swing by on Thursday and right now the models are having a hard time deciding if we will see snow or rain, so we will need to keep a close eye on that. By Friday and Saturday highs will be near freezing, so most of the day will be below freezing. Stay dry out there today and have a good one! There is one day a year when it is appropriate to bring ALL of your sweater vests to work...that day is today. It is the International Sweater Vestival Day. It is the second Friday after Thanksgiving and it is appropriate to wear yours and bring extras for the rest of your co-workers. I will be switching into a different sweater vest every commercial break for our FOX show this morning for some fun in the celebrations. Mopeds...sweater vests...I am not what you may call main stream, but I sure know how to put a smile on your face. On to the forecast. Today will be partly cloudy with highs in the lower 40's. Saturday we will warm into the low 50's...same for Sunday. The clouds will increase for Saturday and rain will arrive for Sunday and Monday. Temps will fall through the day on Monday and by Monday night into Tuesday, still watching the chance for a little snow. We will dry out for the end of next week, but it will be pretty darn cold so if you are waiting to winterize your windows of the house, or dragging your feet for the winter clothes...might as well get ready. Enjoy your weekend, Sweater Vestival Day, and have a good one! Sure enough, the fog was as thick as pea soup this morning. The only disclaimer is that the fog is VERY patchy. My house was clear then as I drove through West Carrollton, into work, the fog became very thick. As soon as I pulled out of town the fog cleared up instantly. So just be careful heading into work or school this morning. Temperatures are also below freezing so watch out for a few icy spots because of all the rain we saw just two days ago. I know I had to take a detour into work because of the Great Miami River flooding my normal route. Plenty of sunshine today when the fog burns off. Temps will be in the mid 40's today and tomorrow and we will warm up to 50 for Saturday and Sunday. Rain returns Sunday and Monday with falling temps behind the system. By Tuesday we could see a little snow mixing in once again. The middle of next week will be bitterly cold, so enjoy the mild temperatures this weekend. Drive safe and have a good one! As far as the snowfall totals, it appears that Darke and Shelby counties had seen the most snow with some reports between 3-4" of snow. Most of the north saw about 2-3" and the rest of the Miami Valley saw about an inch...unless you lived to the far south where they only saw a dusting. So, my second blog entry yesterday afternoon held true. The snow started falling yesterday afternoon instead of the evening. Temperatures fell a little faster and this allowed the snow to start falling earlier than the evening hours. Hopefully this was a good first test for drivers to remind them of how to drive in snow. I say that, but little to no snow stuck to the road so I still think our next "sticking" snow will be the true driving test. 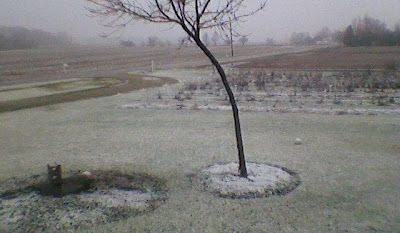 If anyone was on Twitter or Facebook and had a lot of friends around the Miami Valley, you would know it was snowing... EVERYONE was talking about our first measurable snowfall of the season. 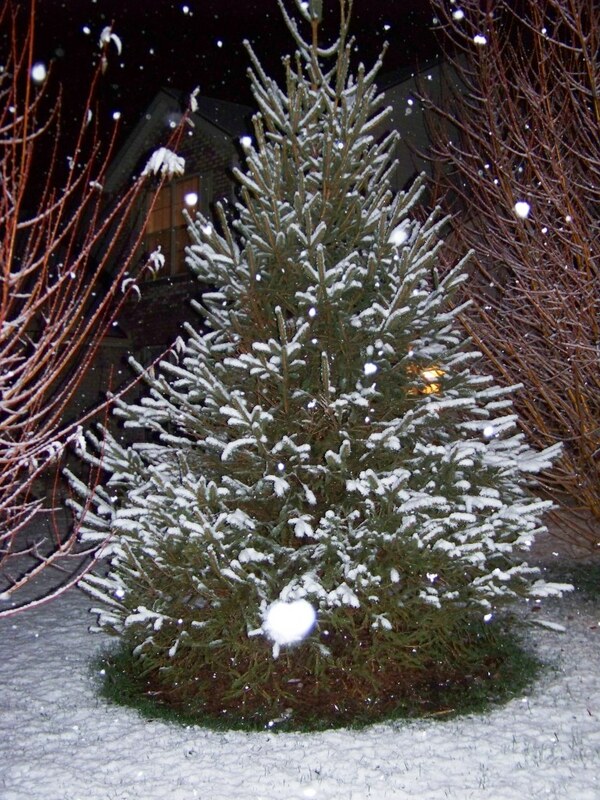 I had to get some sleep while it was at it's thickest depth in Dayton, but Dawn's cousin snapped the photo of the snow covered pine tree in Miamisburg last night...very seasonal. I was able to at least see the snow start falling before bed. Buckeye was not a fan of the snow...he loves being hot, not snow-covered. Most of the inch of snow we did see had melted before I left the house on my way to work... just a melting dusting on the lawn. The snow is pulling out of here, but we may still see a flurry or two this morning. The clouds will give way to sunshine later today, but we will only get into the upper 30's. Tonight we will drop off to a low around 24. With clear skies, light winds, and PLENTY of moisture we may see a little fog Thursday morning. If we do see fog, it will likely be freezing fog so the roadways tomorrow may be worse than today, especially the bridges. They will freeze first because the wind will go under the bridge and cool them off much faster. We will stay dry and cool for the rest of the week. Rain returns Sunday and we could be dealing with a similar snowy situation on Monday. Next week is looking VERY cold after the system moves out Monday. I will keep you posted on the Sunday-Monday system in the coming days. Stay safe out there and have a good one! Also, Happy Birthday to my wife, Dawn. I have been keeping a close eye on the temperatures throughout the day and we have cooled off a little more and a little faster than the models were showing. So instead of the rain switching over to snow just before midnight we are already seeing snow here in the Miami Valley. The picture is taken by my brother in Darke County where they started switching over to snow around 3:30PM today. Since we will be cutting the rain short and seeing all snow sooner, here are my updated thoughts for tonight. To the far northwest 2-4" for Wayne, Randolph, Mercer, Darke, Auglaize, Shelby, and Miami Counties. For counties that border these counties, they can expect up to 2" of snow... such as Logan, Champaign, Montgomery, and Preble Counties. The rest of the Miami Valley will likely pick up about an inch of snow, or less to the south. Remember, the ground is still above freezing so it will stick for a short time and last the longest on the grass and mulch. The snow on pavement will melt fairly quickly unless you have a quick heavy snow shower. Parts of the area are under a Winter Weather Advisory meaning this is our first measurable snowfall for the season. While I doubt many of us will really need a snow shovel for this event... might not be a bad idea to find it in the garage if you live far northwest of Dayton. Heading to bed shortly so I can get into the weather center early tomorrow morning. Travel safe and as always, have a good one! Well it is knocking on the door. The rain is still falling outside and we have seen nearly two inches in the Dayton area over the last couple days. The cold air is already starting to filter in from Indiana. As temperatures fall later we will see the rain start to change to a rain/snow mix this evening after sunset and all snow by Wednesday morning. The models are fairly consistent for the predicted snowfall totals. It appears the Northwestern part of the Miami Valley will see up to about an inch of snow. The further north and west you live the better chance you will see more snow. I think Dayton may see a light dusting if the snow falls quick enough and the far south may only see a few flurries. Keep in mind that the ground is wet and still above freezing. The snow will only stick for a short time before melting. The best chance for snow will be between midnight and daybreak tomorrow so the morning commute could be a little hairy...again, especially north and west. We lucked out because it appears Indiana will be getting the worst punch of this wintry system. Temps will remain cold for the end of the week with highs in the low 40's and overnight low's near 30. There are two more rounds of winter weather possible, Friday and late Sunday. The Friday system has very little moisture to work with, but still worth watching. Sunday night into Monday morning looks like more of a pesky system with more moisture. The temperature will determine if we are dealing with rain or snow so I will keep a close eye on that. First we have to get through tonight and if I see any changes to the forecast I will update my blog later today. Stay dry and keep the rubber on the road tomorrow. Have a good one! Boy, what a weekend. Horrible for sports and Mother Nature even cried on Sunday...and still crying. I knew that Buckeyes and Browns would likely lose this weekend, but I still kept up my hopes. Buckeyes had several chances to win, but they fell through...just like the Browns. You have to give credit for Bengals and Michigan for pulling through and winning. I spent the weekend in Cleveland with Dawn's family to celebrate Thanksgiving. Dawn has told me several times about how horrible the traffic always is on the Sunday after Thanksgiving and she was VERY set on leaving as soon as the Browns game was over. Sure enough we hit the back-up just south of Mansfield on I-71. The highway goes from three lanes down to two. The narrowing of the road, steady rain, and several accidents meant that it took us about 90 minutes to travel 12 miles. It normally takes about three hours to get from her parents to our house in Dayton...last night it took five hours. That meant I only was able to get about three hours of sleep last night. I think a nap is a must, especially to make it to the Dayton Area Moped Riders' Holiday Feast tonight. Well the temperatures are a handful of degrees warmer currently than what I was thinking Friday. That means instead of seeing snow, we are just barely too warm and we are seeing rain instead...good thing too because the system has a lot of moisture. The rain showers will stick around the area pretty persistently for today and Tuesday. Tuesday night we will fall below freezing and could see a few snowflakes. When we fall below freezing will determine how much snow and where. Best chance will be the north for any snow. I will break that down tomorrow when a more precise forecast is possible. We will have highs near 40 and lows in the upper 20's for the end of the week and into the weekend. There will also be a couple more rounds of winter weather possible Friday and Sunday. I will be keeping a close eye on those as well, but right now it does not look like a lot of moisture will be with these systems. Stay dry and have a good one! It has been a tradition that everyone at the station the morning after Thanksgiving bring in a dish for our Feast. That means our engineer, master control, production team, producers, reporters, myself, and the anchors. By Black Friday many people are burnt out on turkey and mashed potatoes so we have a wide array of sausage links, sweet potatoes, cracker and cheese trays, desserts, dips, not to mention good coffee. It is always fun to see what people cook up. Brandi, one of our morning directors, always makes some amazing food. Her dad attends a lot of meat cooking competitions and the sausages she brought in today were AMAZING. The dark ones were really spicy so keep the water handy! So the forecast in yesterday's blog looks to be holding true. We do have a little morning fog that will burn off in a couple hours. Nice today and Saturday with clouds slowly rolling in and highs in the upper 50's. Rain will arrive late Saturday night into Sunday morning followed by much colder temperatures. Later Sunday we will be cold enough for a little snow to start falling. We could see a few light snow showers Sunday night into Monday. Right now there will be light to no accumulations. The Northern counties will have the best chance for light snow. Cold air will stick around all next week with highs near 40 and lows in the mid-upper 20's. Another system comes through next Thursday with even more cold air behind it. I am off to Cleveland for the weekend to celebrate Thanksgiving with Dawn's family. I will be watching the Buckeyes and Browns game from there. Enjoy your extended weekend and see you all back here Monday. Have a good one! At the end of yesterday's entry I made mention that the first couple systems of the year always tend to lift north and warm up. The forecast model must have heard me. This image is of the same time frame as yesterday's model. The low pressure is now forecasted north of Maine, we have warmer temperatures, and instead of seeing a possible rain/snow mix we might be seeing clear skies instead. These winter systems are a little more fickle than many other storms. I will keep an eye on it, but the only way we could have been more different by the middle of next week is if we were dealing with 80 degree temperatures...hey, stranger things have happened in Ohio. I expect a few more changes over the coming days. In years past there may be a renegade model a week out that actually pans out and shows snow and it turns out accurate, despite models closer to the date straying away from what actually will happen. Quick check of your Thanksgiving Day forecast. Yesterday was a beautiful afternoon with plenty of sunshine and mild temperatures. Today will be much of the same with a little morning fog or cloudiness. We do have a few thin clouds now that will burn off quickly when the sun comes up (writing this at 4:53AM). Mild and mostly sunny for Friday as well with highs over the next few days in the upper 50's, near 60. Rain will roll in late Saturday night into Sunday morning and bring the cold blast of air. We could see a few snowflakes mix in late Sunday and maybe Monday. The moisture looks to pull out quickly, but we will still will be cold next week with highs near 40 and lows in the 20's. Enjoy your Thanksgiving and have a good one! The models have been hinting at a trough of cold air swinging through for the start of December. Now that that time frame is within shooting range it seems to be holding consistent from model to model, for the most part. The last couple rounds of models are showing a low pressure system getting lost from the flow of the jet stream and sitting over us early next week. This will allow cool temperatures and extended periods of rain for early next week and when a secondary cold blast of air arrives for the middle of next week...it will pull the colder air into the area a little stronger. Soooo, what does this all mean. The image attached shows three important factors in our snow chances for next week. You may notice the blue and red lines. These are the temperatures just a short way above the surface of the earth. You can see the freezing line of 0 degrees Celsius hugging the plains and the Midwest. The -10 degree line taps into parts of Minnesota, Wisconsin, and the U.P. of that state up north. So the cold air will be in place. On to the black lines: these are the lines of pressure. The low pressure system that will begin lifting north by next Wednesday (according to the timing of today's model) will be a fairly strong system with a pressure of around 995 mb. The last and most important ingredient for us seeing snow...moisture. We are on the the third tier of amount of precipitation for the 12 hour window the model predicts. It appears there is plenty of moisture also higher in the atmosphere with cold air as well. So here is what we are looking at for the forecast. The rain and clouds are on their way out of here. We will be dry all the way until Sunday. Today we will only get into the low 50's, but still on track to get into the mid 50's for Thanksgiving, tomorrow. Highs near 60 for Friday and Saturday before the big change in weather. The low pressure system will swing in on Sunday and put its brakes on and just sit around the Midwest for Monday. This will bring scattered showers for Sunday and Monday with highs in the upper 40's. The second cold blast of air is what we really need to time out to pinpoint our chance for snow. Right now it appears that the blast of cold air will arrive late Tuesday so we may see a few flakes of snow mixing with rain later Tuesday. If the cold air arrives at the predicted time we could see a switch over to mostly snow heading into Wednesday morning. Timing will be the deciding factor into when and where all of this happens so we still have a week to see what pans out. Remember, forecasting winter storms this far out is a lot like bowling down a lane that is about three times the normal length. It is especially difficult to forecast the first few systems...they typically pull north and we warm up at the last second, but with the Low already sitting over us a few days this is a little different. I will keep an eye on the situation and as always...keep ya posted because I have a feeling there will be changes by next week. Thanks to my mother having Thanksgiving dinner the Sunday before the holiday... it allowed Dawn and I to enjoy two thanksgiving dinners before the holiday even arrived. We both love the food that is associated with the holiday. My mother sent us home with a LOT of leftovers. Thanksgiving is one of the best holidays. Everyone gets together, no need for gifts...just enjoy the fellowship of friends and family...and of course good food. The steady rain is almost here. The wall of rain is moving in from the south and we will see steady rain through most of the late morning and early afternoon, heavy at times. The rain will pull out of here by tomorrow morning. We will get into the upper 50's today but only get into the lower 50's tomorrow. Thanksgiving will be mostly sunny and we will get into the mid 50's. Friday looking great as well with upper 50's and plenty of sunshine. Clouds will roll back into the area for the weekend and with that a chance for rain. Next week the models are hinting at cold air trying to push back into the area and trying to set up camp...so I will keep an eye on it because right now it has a strong trough of cold air over the Pacific for the weekend. Stay dry and have a good one! Saturday was a bit of a bittersweet letdown. Dawn and I went back up to Ohio State for the Penn State football game. We went with her cousin who recently traded for an older public transport bus which is now converted into a party bus complete with television and lots of seating for a big group of people with still plenty of room to lay out the party spread. It was a lot of fun to return to Ohio State for the first time since Dawn and I got married at Browning Amphitheater in July. Mirror Lake and Browning were not nearly as green as what they were earlier in the year. We also met up with a group of meteorology students we graduated with, who also came up to tailgate. I really miss all of those guys who are just as nerdy as I am. Good friends whether the weather is good or bad. We watched the first quarter in the party bus and then we went over to High Street to watch the rest of the game. It was a sad game because we had the chance to win the game several times, but sadly we did not win. This brings on Beat Michigan week. I really miss this week on campus because no matter what the record...it is all erased and everyone focuses on one game to set the mood for the season. Yesterday we visited my parents' farm and we had a lot of fun celebrating Thanksgiving. My three brothers, myself, and our father got into a silly heated debate. We were talking about ceramic drainage tiles that help drain flooded areas of the farm fields. The debate was over how the tiles initially break and cause sink holes over time. My brother Clark made a few statements that easily had a few "cracks" in it and we had fun picking apart those cracks. He claimed the velocity of the higher elevation of the tube would be faster than the lower elevation of the tile. This would be true if you have a blow hole, but we were arguing about a solid tile that had no blow holes...so it would have to be the same velocity...all simple physics. Dawn said she was going insane because when we all get together we are VERY loud and "debate" over the some "boring" topics in her opinion. I had fun, haha. On to your Thanksgiving week forecast. Today we will have a few light scattered showers, but most of the showers will be hit or miss with mild temperatures. Tuesday will be pretty much a wash-out with showers and storms most of the day and a high in the low 60's, so even warmer. The rain will move out just in time for early holiday travels on Wednesday. We will cool off a bit with highs in the low 50's for Wednesday, mid 50's Thursday and near 60 for Friday. Thanksgiving looks mostly sunny and mild heading into Friday morning with a low of 38 for any Black Friday shoppers. Much warmer than the years I participated. Working the morning shift kinda limits my Black Friday shopping. Back to the forecast...working on a holiday travel forecast graphic across the region. Have a good one! COLD! As I mentioned in my last few entries, I won't have my truck back until later this week. I did not have rental coverage on my insurance(thought I did), but I did add it for future instances. (Hopefully wont need it.) Anyway, I embraced the idea of riding my moped when I couldn't borrow my wife's car. This morning it was about 34 degrees so I bundled up really warm. The only cold parts of my body was my ankles and wrists. I tucked my scarf up into my helmet and it was foggily warm. 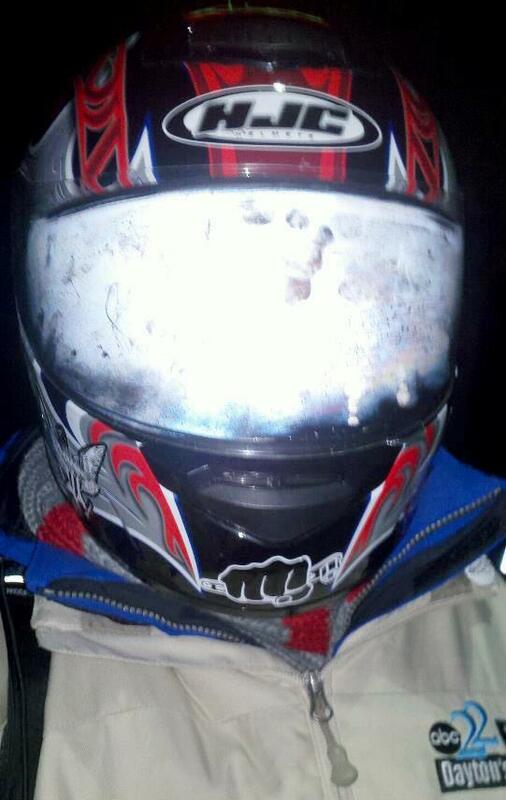 This image was a little exaggeration of how foggy my helmet was, but you get the idea. I took the photo once I got to the station and locked up my moped. I will now be wearing taller socks tomorrow and making sure I pull my coat sleeves over my gloves for the ride home. Despite how cold it was, it was still a LOT of fun. We will slowly warm into the lower 40's today with sunshine returning after a partly cloudy start. It will be rather windy today. Tonight we will drop into the mid 20's for lows and our coolest temperature of the fall so far is 28 degrees, so we could be dealing with the coldest night of the season so far. We will slowly warm into the mid 40's tomorrow, mid 50's Saturday, and then upper 50's on Sunday...just as rain returns. We could see a few showers Sunday, Monday, and Tuesday. Temperatures heading into Thanksgiving will be cool with highs in the mid 40's. Well back to the news...have a good one! Yesterday's storms were a bit of a letdown, but as a weather geek it was still a lot of fun. I was lucky enough to ride along with SWAT, Severe Weather Alert Team. I met up with the first vehicle in Arcanum. We then headed west to Indy. Once we got to Indy we took a look at the situation and there was a nearly solid line of cells across Northern Illinois, Indiana, and Ohio. The most fuel for the thunderstorms was in Southern Ohio/Indiana and the maximum rotation in the atmosphere was in Central/Northern Indiana and Ohio. We were hoping to have a rogue cell pop-up to tap into this area, but all of the storms stayed in the line to the north and it slowly dropped south into the energy. We geared up and headed north in both vehicles to monitor the approaching line of storms. Since it was a line they were all fighting together for the energy they shared the conditions feeding the storms. No cells popped up ahead of the line and hogged up all the energy and rotation. Another cause for the storms possibly did not develop as hoped was that the upper level winds in the atmosphere were screamingly strong. Had they been slightly weaker we could have had the showers ahead of the line become more developed. Here are a few images to give you an idea of what happened yesterday. The line of storms was all fighting for the energy. If we could have had one or two decent cells pop out ahead of the line we could have had a much different story, but instead we just dealt with the line of storms. We still saw a few strong storms with hail over an inch in diameter, but no tornadic storms in Indiana or Ohio. There was only one tornado in Illinois, earlier in the day. No storms today. We will see showers, mainly south of I-70 for today. The showers will pester the Southern part of the Miami Valley through tomorrow and then finally kick out of here. Cooler temps still on tap for later this week...dropping from upper 50's today, to 40's for the next couple days with lows below freezing Thursday and Friday morning. We will warm up a little for the weekend, but more rain by late Sunday and Monday. After only a little over three hours of sleep, I will now let you go. Grab me a coffee and have a good one! We have really seen a lot of changing weather over the last week. We had snow showers last Thursday and we warmed up into the mid 60's for the weekend. We will soon be blasted by cold air again later this week, but first...a strong cold front. We are already seeing strong showers this morning across central Ohio and Indiana. Once we get into the afternoon a little upper level support and daytime heating will help support a slight chance for severe weather. There is a little directional wind shear, which could support a very slight chance for tornadic storms, but it appears we will likely be dealing with strong winds and hail as more of a threat. Best chances will be the western counties because the timing of the storms looks to roll through right before dusk. When the sun does down, 5:22PM, we will slowly lose power for the storms. I will be keeping a close eye on the situation from home just in case I need to come in and I am sure Jeff Booth will be watching closely from the weather center. Speaking about coming in... I am taking my truck to the body shop today. After a fender-bender it will need to be there for about four days as they replace and paint parts. I could have swore that I had rental coverage with my full coverage, but apparently I do not. (I did add it though) I am resorting to riding my moped this week. I already brought a few suit jackets to work today to prepare for the cold, possibly wet, morning rides on my two wheels. I have been mentally preparing myself for morning rides below freezing...so when you see me later this week on the morning show with rosy cheeks you will know why. Dawn does have a few school talks this week in the late morning, so I may be able to take her car a day or two. Either way, I am embracing the idea of moped commuting in the cold. As I stated, we have a slight chance for strong to severe storms this afternoon. Showers will push south tonight and the Southern part of the Miami Valley will see the best chance for rain overnight into Tuesday. The entire area will see cooler temperatures slowly arrive as we head into the end of the week. Highs for this week will be mid 60's today, upper 50's tomorrow, and mid 40's for the end of the week with lows in the upper 20's later this week. We will warm up a little next week...so looking good for tailgating at the Ohio State-Penn State game. Stay dry and have a good one! Well the flurries did not disappoint yesterday. Rain/snow showers started forming in the afternoon and were widely scattered through the evening. Once the temperatures dropped, it switched to all snow and Brandon Redmond, of Darke County, with the Severe Weather Alert Team, SWAT, managed to grab this image of the snow falling on their Severe Weather Emergency Response Vehicle, SWERV. The SWERV is their storm chasing vehicle. You can make out the logo on the hood when the snow started, but after a short amount of time the snow continued to cover the vehicle. They were lucky enough to be under one isolated snow shower in the evening. Most of the area did not see snowfall that impressive, however many of us did see our first snowflakes of the season. Twitter was all abuzz about the snow in Dayton. I am sure SWAT got a few more photos and feel free to check out their site: SWATChasers.com, special thanks to them for sharing the photos. On to the forecast. Today will be chilly, again. Right now most of the area is sitting in the upper 20's and wind chills around 20. We will reach a high in the mid 40's today with mostly sunny skies. Tomorrow we will warm into the upper 50's for a sunny Saturday. Lower 60's for Sunday and Monday, with a chance for rain both days. We will dry out later in the week but with chilly weather, much like today. Stay warm, enjoy your weekend, and have a good one! Not sure how it happened, but I came in this morning and my station coffee mug had the handle busted off. How am I supposed to handle with care with no handle? Luckily a former coworker had got me a few large wilderness coffee mugs as wedding gifts. I wanted to register for the entire wilderness dish set for wedding gifts but Dawn said everyone would get them for us because they would think it was a good joke. Joke is on her because I LOVE my huge mug and it came in handy this morning as my back-up. Still not sure how it was busted in my filing cabinet drawer, but hopefully I can get a new mug since I am not sure they want me drinking out of the moose mug on-air. The rain is starting to roll into the area this morning. Temperatures will top out around 60 today with on and off rain showers and then drying out later this afternoon as the temperatures take a nose dive. We will drop to the lower 30's by tomorrow morning. Highs tomorrow will barely get into the mid 40's with partly cloudy skies and there is a slight chance for a sprinkle or flurry later in the day. Friday much of the same...chilly and partly cloudy. Saturday we begin to warm back into the 50's and we will continue to climb into the low 60's for the start of next week. Rain will arrive on and off late Sunday into Monday with more steady rain will arrive on Tuesday. Stay warm and dry...and have a good one! Enjoy the weather today. We will be warming up close to 70 degrees with partly cloudy skies, but big changes will be arriving for the coming days. Rain will arrive Wednesday, tomorrow, and that will start a cooling trend. Highs will fall into the mid 40s for the end of the week and lows near or below freezing. The good news is that we would slowly warm heading toward next week, but more rain will arrive for the start of next week. Hope you can get out there and vote today then enjoy the beautiful day. Since Friday night high school football is winding down, I have been pulled off the schedule to shoot football and now I will be a news photographer a handful of hours a week. I will start doing that today and it will work out perfectly with election day. Election day is always SUPER busy at the station so I am sure that our Assignment Editor will be very happy to know I will be joining the staff today. I caught up on sleep yesterday and I will be able to enjoy the nice afternoon today. Hopefully you can do the same...have a good one! My bike made it. After taking the time to rebuild the engine last winter, I now know the pleasure of taking the time and doing it right. I think my bike knew that this trip would be it's last trip so it just chugged along before getting a new rebuild this winter. Our group left Cincinnati on Saturday morning and rode about 60 miles south to a state park in Carrollton, KY. The group from Louisville beat us to the park. It was a beautiful trip with rolling hills and occasionally bumping into the Ohio River. While it was very chilly camping out, it was a lot of fun to meet up with my moped friends for the last group ride of the year. This was also my first time volunteering my truck to be the chase vehicle. So when a bike broke down we would put it in the bed of the truck and one of my dear friends was ever so kind and drove the truck while I rode my moped. We ended up with five mopeds in there by the time we finished the 120 mile trip and made it back to Cincinnati. I did notice that the ONLY bikes that finished the trip were mopeds that were rebuilt with new bearings and seals or completely stock bikes. Note: don't just throw a kit on it...rebuild it first. Lot of fun, but today I will be catching up on sleep. While the weather was great this weekend, it will not last all week. Today and tomorrow will be mild with highs in the 60's. We will have rain just to our west the next couple days, so the far Northwestern part of the Miami Valley could see a few sprinkles or light shower, but the rain will hold off until Wednesday to push through the entire area. This will bring in much cooler air for the end of the week. By Thursday and Friday our highs will be in the mid 40's and overnight lows below freezing. There is a slight chance for a flurry or two Thursday with a little wrap-around moisture behind the cold front. We will warm back into the 50's by next weekend and maybe another chance for rain late Sunday...but that is still a long way out so I will keep ya posted. Enjoy the nice weather today and have a good one!